At the end of The Mary Tyler Moore Show theme song, Mary Richards is so happy to move to Minneapolis and start a new life that she throws her hat in the air. She has a new apartment and job at the WJM TV station, becoming close friends with characters played by Valerie Harper, Cloris Leachman, Edward Asner, Gavin MacLeod, Ted Knight, Georgia Engel, and Betty White. At the start of the series, Mary has just come to town after breaking off a long relationship. She moves into the apartment and hangs a giant M on the wall of her spacious one-room apartment. Rhoda (Harper) lives upstairs in a converted attic and Phyllis (Leachman) lives below. Originally built in 1892 for $15,000, the home is located at 2104 Kenwood Parkway in Minneapolis. 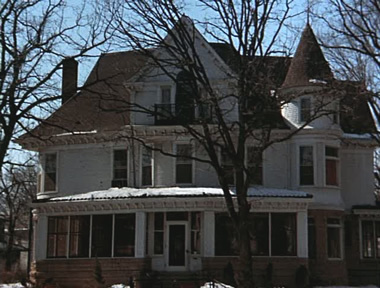 The location was eventually discovered by fans, and the homeowner was constantly bothered by people knocking on the door and asking if Mary was around. 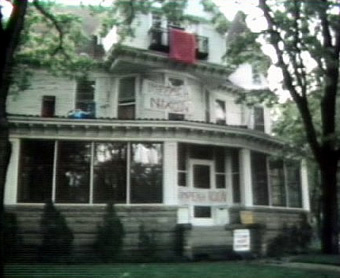 The owner hung “Impeach Nixon” signs to discourage the show from filming any more exterior shots of the home. It has changed owners several times throughout the years and now has a beautiful interior filled with hard wood floors. To this day, fans still stop outside and take pictures of the home. But, you don’t have to travel to Minneapolis to see it. We’ve set up another “virtual road trip” so you can visit the “Mary Tyler Moore house,” see what’s next door, look across the street and down the way — all from the comfort of your own chair. The house reportedly now has eight bedrooms and seven bathrooms. The home is 9,839 square feet and is valued at approximately $2.4 million. You can see the beautiful interiors here.